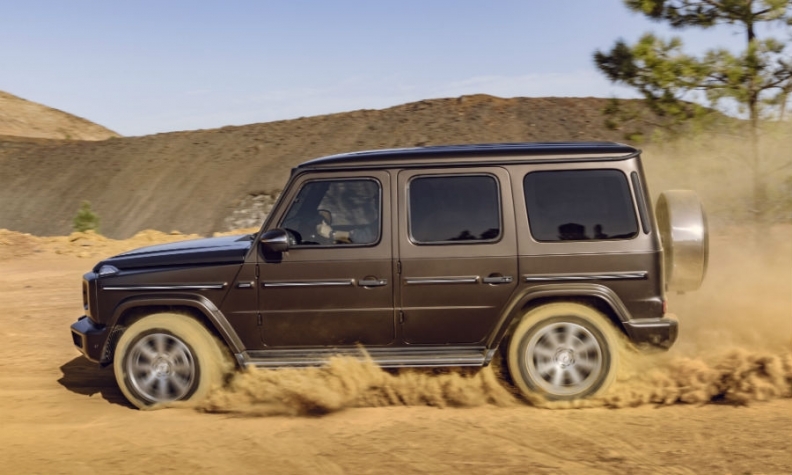 The G class has been given its first full redesign in nearly 40 years. It keeps its boxy design but gets tech and comfort upgrades. DETROIT -- Mercedes-Benz said the new G class will go on sale at the same price as the current car even though the rugged SUV's handling, comfort and safety has been significantly upgraded. Daimler’s luxury brand said the primary goal of the most thorough redesign in the iconic SUV's nearly 40-year history was to improve the SUV's road-going comfort and agility without sacrificing the precision needed when the vehicle is driven off road. New features include LED headlamps, a range of driver assistance systems, a higher quality interior with leather seats and leather trim on the interior door panels. Mercedes carried over just three parts from the current model for the new G class, Daimler CEO Dieter Zetsche said at the show on Sunday. The door handles were among the few parts carried over, said Zetsche, who also told reporters he was responsible for G-class development as a young engineer in the 1980s. "I'm still around and so are over 80 percent of the G-class models ever built," he said. The G class had its best year in 2017 with global sales of more than 22,000, Zetsche said. The G class's notable design elements include distinctive door handles and the exposed spare wheel on the rear. Like the new X-class pickup that launched late last year, the G class continues to be built over a sturdy “ladder-type” frame as opposed to a monocoque. The ladder is 55 percent stiffer. It has double wishbones up front as well as a rigid axle in the rear that uses a Panhard rod to minimize roll. A suspension bridge connecting the front struts adds further rigidity to the frame. As soon as one of the three differential locks has been activated or the low range off-road reduction gear has been engaged, the SUV now changes to “G-Mode,” This adapts the adjustable dampers, steering and acceleration to provide a more effortless maneuvering around rough terrain. Tilt stability offroad has been increased by a quarter to 35 degrees, while a ground clearance of 270 mm to the front axle means it it can traverse bodies of water as high as 700 mm without risking engine damage. Improvements were also made to the chassis for onroad driving. Thanks to a new electromechanical rack-and-pinion steering that replaces the previous hydraulic system, Mercedes can now include some Level 2 assistance features such as Parking Assist. It also introduces the use of mixed materials to reduce weight by 170 kg, with the wings, hood and doors all made of aluminum. The body additionally underwent a diet after engineers employed high-strength steel in the A and B-pillars to slim down. The new design improves torsional rigidity, reducing noise and vibration in the passenger cabin. The G-class's technology credentials are on par with that redesigned E class, a company spokesman said. The brand had touted the E class as its most advanced vehicle. The G class interior borrows elements from the E class and S class cars. The new G class is 53 mm longer and 121 mm wider, allowing it to better squat the road while adding 150 mm more legroom for backseat passengers. The vehicle’s exterior styling has been retained with only minor changes such as more integrated wheel arches and bumpers that look less like add-ons. G-class buyers are among the wealthiest and most loyal customers in the Mercedes-Benz family and are passionate about the SUV's looks. They saved the G class when it was slated to be replaced by the brand's first unibody crossover, the 1998 M class. Respecting the boxy shape while redesigning the G class was key, said Gorden Wagener, Daimler's chief design officer. "You have to treat it very responsible, otherwise it wouldn't be a G," Wagener said last year. On the inside, the G class can be ordered with the same digital cockpit found in the E class and S class while haptic impulses help drivers utilize the center console without taking their eyes off the road. Other improvements include front seats that provide more upper body support including integrated air chambers in the sides that inflate or deflate continuously depending on the driving dynamics minimize lateral movement when cornering. “The new G class is setting the bar higher still in all relevant areas – in terms of performance both on and off the road as well as with regard to comfort and telematics,” said Mercedes development chief Ola Kallenius. 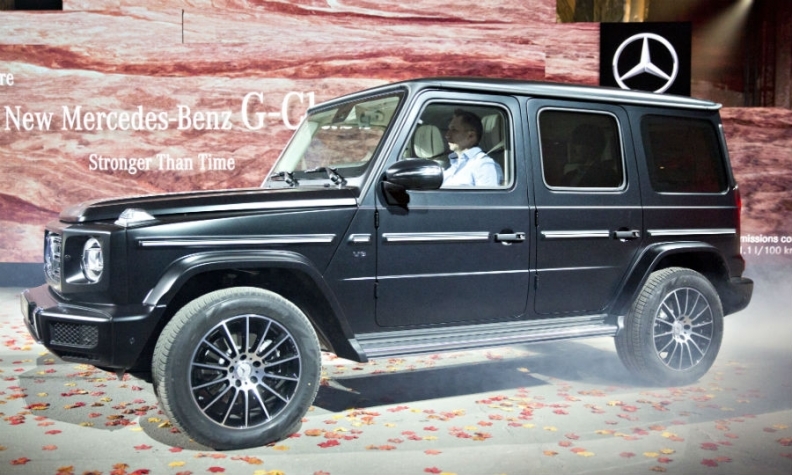 The G class is a niche model built by contract manufacturer Magna Steyr in Austria. It was Mercedes' first offroad vehicle and is its longest running model line. Altogether just over 300,000 units of the model have been built since its launch in 1979. The G 500 entry-level model will be the first variant to go on sale. It will be powered by a 4.0-liter V-8 gasoline engine married to a new 9G-Tronic automatic transmission. Output is boosted to 416 hp with the aid of twin turbochargers while torque hits a maximum 610 newton-meters. Launch dates are May for Europe, July for the U.S. and autumn for China. The G 500 will start at 107,040 euros in Germany, the same level as the current version, Mercedes said. European sales of the G class jumped 27 percent to 4,389 in the first 10 months of 2017, according to JATO Dynamics. The United States is the biggest global market for the G class. U.S. sales rose 6 percent in 2017 to 4,188.